Normally a fixture in the Brooklyn-Queens diocesan championship game, the Royals were on the outside looking in as Bishop Loughlin H.S., Fort Greene, defeated Xaverian H.S., Bay Ridge, for the diocesan crown. 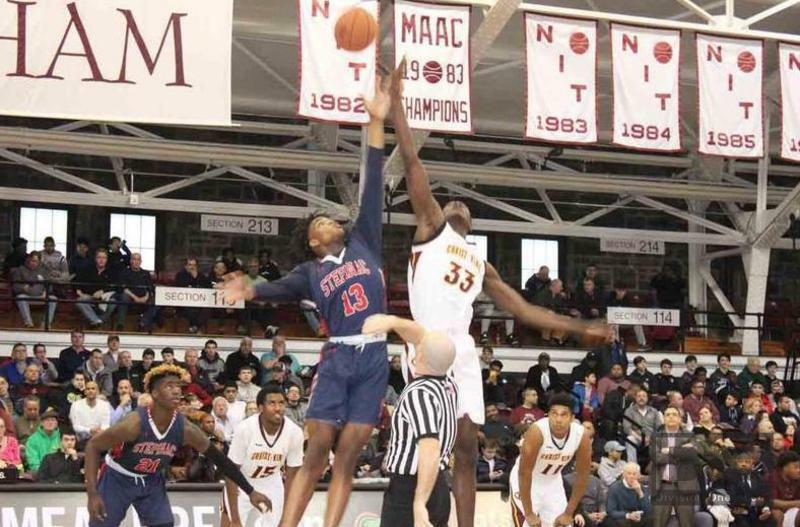 Christ the King though had a statement win over Bishop Loughlin in the city semifinals to send the team to the title game against the defending city champion Stepinac Crusaders. An 8-2 run by Stepinac to close out the first quarter gave the Crusaders a nine-point lead after the opening frame. That lead increased to 12 early in the second quarter on hot outside shooting by junior guard R.J. Davis and sophomore guard Adrian Griffin Jr. – two of the top three scorers in the ‘AA’ Division during the regular season. Stepinac led by eight, 39-31, when the first-half buzzer sounded. Davis contributed 20 of his team’s 39 first-half points on 6-of-8 shooting to go along with five rebounds and three assists. The Royals struggled from the field in the first half, missing all seven of their 3-point attempts. Meanwhile, Stepinac managed to shoot 5-of-11 from downtown, which allowed the team to maintain the lead for 15:02 of the first half compared to just 24 seconds for the Royals. The Crusaders continued to knock down big shots as the third quarter began and opened their largest lead of the game at 14 pts. at the midway point of the quarter. Christ the King though finally began heating up from the field. Junior guard Ryan Myers, who averaged 16.2 pts. per game during the regular season, drained a rainbow 3-pointer – the first of the game for the Royals – which began the upward climb of getting back into the game. After three quarters, Christ the King was down seven. Myers immediately hit another three to start the fourth quarter. Trailing by five a few minutes later, Myers again connected from beyond the arc to make it a two-point game midway through the final frame. The Royals kept chipping away, and a free-throw from Myers tied the game at 56 with 2:30 to play. That was the first tie since the opening score of 0-0 for the first 13 seconds of the game. With one minute remaining, Christ the King took the lead on an emphatic dunk by six-foot-11-inch sophomore forward Moussa Cisse. It was the team’s first time being ahead since leading 8-7 in the first quarter. Jones followed up Cisse’s dunk with an athletic play to find junior guard Lovell Smith for an easy layup to seal the five-point victory. Christ the King outscored Stepinac 16-4 in the fourth quarter. Those four points from the Crusaders all came on free-throws, as the team was held to 0-for-17 shooting in the fourth. Myers finished with a team-high 19 pts. – 12 of which came in the second half – and three rebounds en route to being named M.V.P. of the CHSAA ‘AA’ Intersectional Playoff Tournament. Senior forward Nathaniel Curry notched a double-double with 14 pts. and 14 rebounds. Jones contributed 12 pts., seven rebounds and five assists, and Cisse also scored 12 pts. while grabbing eight boards and blocking four shots. The Royals now move on to the New York State Federation Tournament to be played March 22-24 at Cool Insuring Arena in Glens Falls, N.Y.